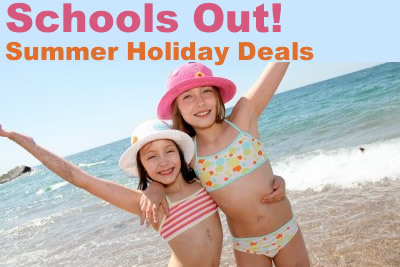 The School Summer Holidays in July and August are a very popular time for family holidays in the UK and Ireland with the best of the weather to look forward to, all the attractions open and lots of events to visit. We have lots of superb self catering cottages and apartments ideal for a family summer holiday in England, Scotland, Wales and Ireland. From cheap budget accommodation to luxury cottages, near the seaside or in the countryside, you are sure to find something perfect for your summer holidays especially as there are some great late availability and last minute deals around. Although often known abroad as vacations, breaks or recess, the UK school holidays are a time when the schools are closed for study and the children/students have an extended break. In the Britain the school summer holidays tend to be about 6 weeks long, running from late to July until the end of August, with schools normally returning back in early September. Ireland tends to have a longer summer holiday, nearly 3 months. This July-August period is when most British families will take their family holidays either in the UK or abroad when the weather is at its best. However, this does mean that the popular attractions and accommodation will be busy during this period. Search for a self catering cottages, apartments or holiday flats in England - choose from traditional seaside resorts, pretty coastlines, rural countryside, picturesque villages and cosmopolitan cities in England. Search for a self catering cottages, apartments or holiday flats in Scotland - choose from traditional seaside resorts, pretty coastlines, lochs and waterways, rural countryside, picturesque villages and cosmopolitan cities in Scotland. Search for a self catering cottages, apartments or holiday flats in Wales - choose from traditional seaside resorts, pretty coastlines, rural countryside, picturesque villages and cosmopolitan cities in Wales. Search for a self catering cottages, apartments or holiday flats in Ireland - choose from traditional seaside resorts, pretty coastlines, rural countryside, picturesque villages and cosmopolitan cities in Ireland.